Discussion in 'XPO Logistics' started by sucker666, Sep 13, 2018. We are hearing of a stark increase in the amount of accidents involving roll overs . Was wondering what everyone thinks is the factors as to the cause. My understanding is that a lot of trailers are being loaded too heavy with safe stack from what I’m hearing. With the 5 mph increase in speed to increase driver satisfaction higher do you think this might lead to even more? Do you think top heavy trailers are a sign of inexperienced dock worker striving for high cube ? What is management doing to assure trailers are not being loaded top heavy ? 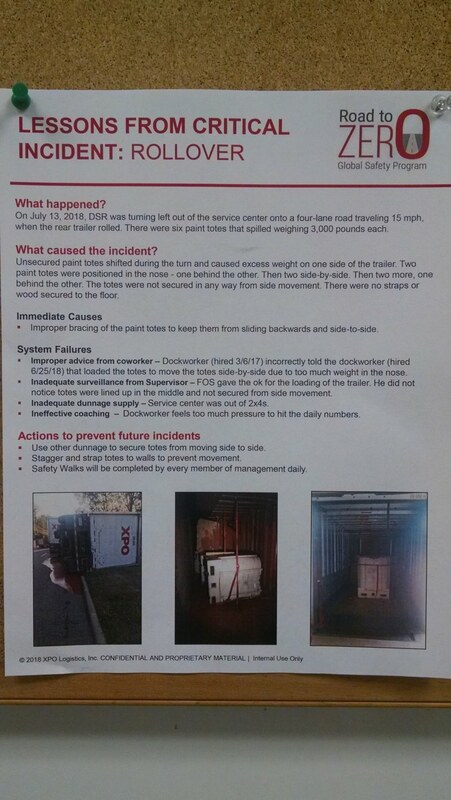 Hows this sound supervisor tells new dock worker to load 2 skids of 55 gal drums up on the bars. lucky someone saw this and told him not too. doubledonger, troubleman84, highspeeds and 1 other person like this. troubleman84, highspeeds, dalesr and 1 other person like this. I’m feel the combination of increased speed and top heavy loads is only going to exasperate the frequency of these type of accidents. I also don’t feel confident that management will do anything of substance to correct poor loading for fear of discouraging high load cube. troubleman84 and highspeeds like this. I have done that. ohhh wait they were empty drums. The best part I was call back to the door and told to put them on the floor and put two 1000lbs skids that were under them on the rack. Real smart lets put 2000lbs in the air and 500lbs of drums on the floor. The dumb FOS had to scan the drums first to find out who loaded them. When I got there I showed him were the weight was on the HH. Man that pissed him off. These new dock idiots are as bad as these new FOS idiots. Just jam it in and keep the dock clean, is the game. Rack can hold #3600. You tell one of these idiots what they are doing is wrong, and they come back with, "you aren't signing my check". Let us pray. When I started, we use to have a driver, drive around the terminal at high rates of speed, taking turns and hard braking all over the terminal. I asked him,why he did what he do, and he told me, "they won't fire you for flipping a box in the terminal, but you will be canned for dropping one on the street". highspeeds and icuicp like this. GOD TAKES CARE OF BABIES AND FOOLS! WHATEVER HAPPENED TO "HAVING THE COURAGE TO INTERVENE!? ( JUST ANOTHER "FLAVOR OF THE MONTH". Bloodwidow and highspeeds like this. Here’s a concept. Slow down. I see guys leaving my fac doing 40 mph as they leave the gate on an inclined approach, trailers groaning and creaking. Why? Just slow down. Serene Gene, doubledonger, troubleman84 and 4 others like this. I see road driver constantly going 10-15 mph over the limit on a 45 mph feeder road to our yard. They always say "the faster I get back, the more money I make." You can't preach safety to guys who pee in bottles to keep from stopping. Fly-by-night, troubleman84, micshol and 4 others like this. troubleman84 and smokin'joe like this. You gotta be crazy to still work here. Amazing how old stale Coca-Cola turns yellow upon exposure to sunlight. I'm not an animal. I piss on the catwalk or the tires. Pi$$ STEAM OFF OF EXAUST! Last time I looked, we were actually down year over year for rollovers. I doubt that will make a difference. It's an increase in top speed, not acceleration. I don't think there are too many guys burning through intersections and around ramps at 65. Sure. FOSs too. Anytime we have an influx of new people the loading suffers for a while. It's nothing new. While influx of new people is a contributing factor , there is a decrease ( an "outflux" if you will ) of experience as far as the correct policies and procedures in regards to safety and loading , among other things. Also , there is a reluctance to step forward to fix or correct issues when they arise. Experienced people working at XPO continue to be frustrated by the lack of effective communication. Ambivalence is high , yet this situation is completely avoidable with the appropriate attention given to training , who does the training , and how it's done. With the XPO seeking to bring back former employees , do you think this is an acknowledgement of a mistake by XPO of letting too much experience leave? highspeeds and mota like this. They showed us a slide presentation showing rollovers were up year over year,maybe you were out that day. So are you saying some of their dock people use loading techniques resembling your avatar??? radman and icuicp like this.